CHORKOWKA: (with Lesniowka) village, is located in Krosno County and is located 5.6 miles from the city of Krosno. Chorkowka is 0.8 Miles long, including 4.47 miles of farm land (for growing crops-added by translator). The village has 70 houses, 420 people, and is a part of Zrecin parish. It has a community with one grade school, (built of bricks), a money lending biuro  an institution founded by Ignacy Lukasiewicz  with funds up to 2000 Russian zloty. On the property of the local nobleman, Ignacy Lukasziewicz, there is a beautiful garden and palace built by the owner. A naphtha distillery founded by him in 1865 is one of the biggest in West Galicya and uses all unrefined substances from mines in Bobrka, Ropianka, and even Jasiel County. Chorkowka is located in the hill country on rye soil. The county high road connects Krosno with Zmigrod which has Macadem to Naphtha mines in Bobrce. In 1876 Honorata Lukasiewicz from Warsaw founded a lace making school in Chorkowka. She brought a teacher from Poznan in 1875 and a big collection of point a laiguilles valenciennes entre deux and applied herself to the task of learning the art of lace making. After she had learned the secrets of the profession, she put herself in charge of the new school. Now the school and a small factory employ 12 girls and are tremendously successful. The type of laces they make is superior to Czechs Wirthschaftsspitzen and is much more practical than Valenciennes. There are some other lace making places in Wadowice County but their product cannot match the excellence of laces from Chorkowka Source Gag. Polska Nr. 34, year 1880. 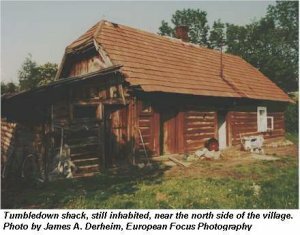 Source: Slownik Geograficzny translated by Michael Kurtin (This information was published between 1880 and 1902 and gives a view of this locality during that time frame). 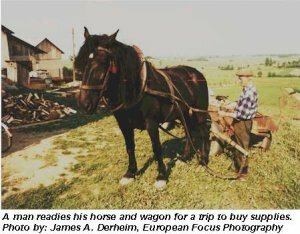 Photographs by James A. Derheim, European Focus Photography.